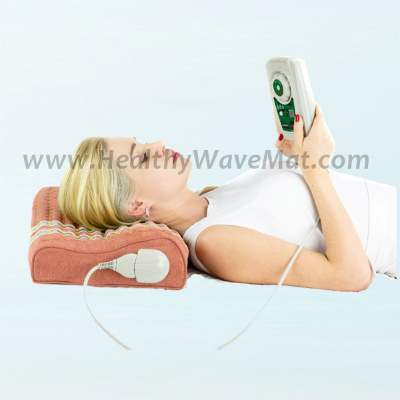 Healthy Wave Mats are a complete 5 therapy wellness solution. They harness key therapies including far-infrared heat, pulsed electromagnetic field therapy (PEMF), photon light rejuvenation, negative ions and natural crystals. These therapies work synergistically together to provide a relaxing and therapeutic experience. 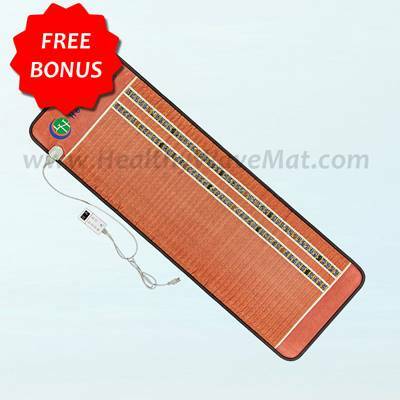 Each Healthy Wave Mat is based around Far Infrared Heat Therapy through the use of crystals including amethyst, jade & tourmaline. When heated these crystals create far infrared heat that penetrates 3-8 inches into the body which improves blood flow & micro circulation by expanding blood vessels and relaxing the surrounding muscles. 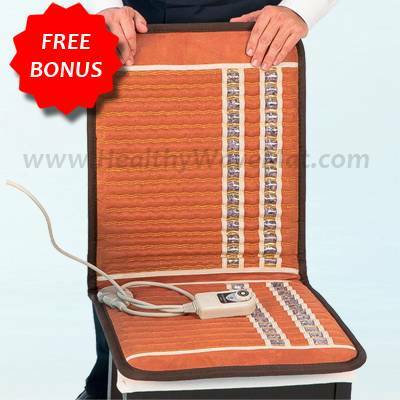 These specialized far infrared heat waves increases metabolism and relieves pain. 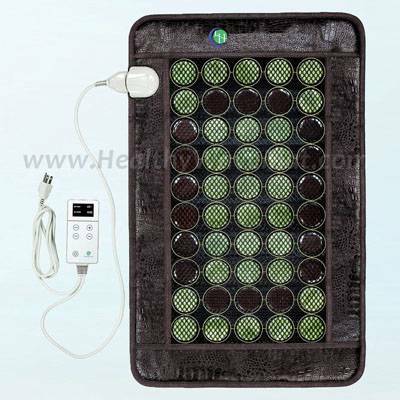 Alone far infrared heat therapy can have dramatic results but it is further improved by the other therapies such as from the negative ions that are also generated by the amethyst, jade & tourmaline crystals used. 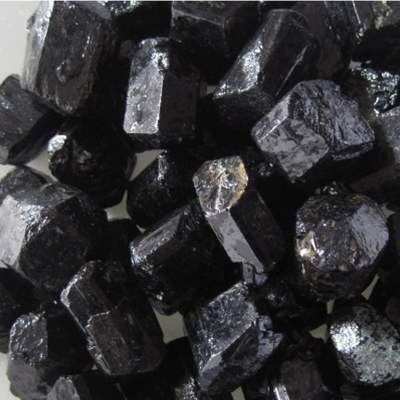 When heated, these crystals can create over 1500+ negative ions per square inch. Negative ions act as anti-oxidants which fight free radicals in the body and are an essential building block for every cell in your body. 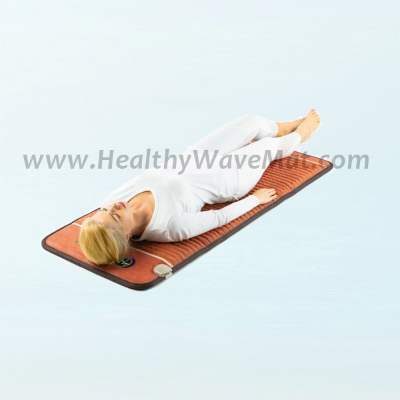 By providing the body with negative ions & far infrared heat simultaneously, like in Healthy Wave Mats, negative ions are delivered to your cells much quicker with increased permeability due to the improved blood flow the far infrared heat as provided. 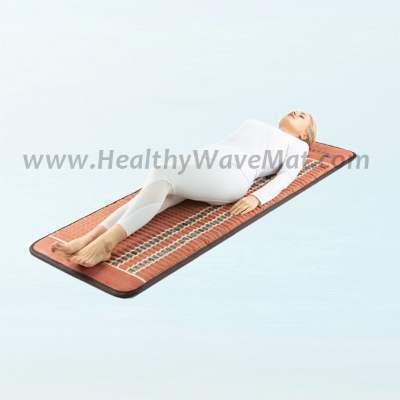 These two therapies are standard and found in every Healthy Wave Mat. 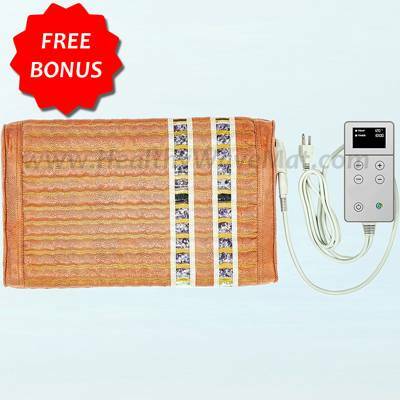 Additionally some models also contain Pulsed ElectroMagnetic Field Therapy (PEMF therapy) & low level laser light therapy which are both further enhanced by the far infrared heat & negative ions. PEMF is a therapy that essentially stimulates cells to regenerate and repair themselves. This is truly amazing as it works for seemingly every type of tissue in the body including bone, cartilage, nerves, muscle, connective tissue and more. Your cells still need nutrients to repair themselves which as you know is delivered by your circulatory system. 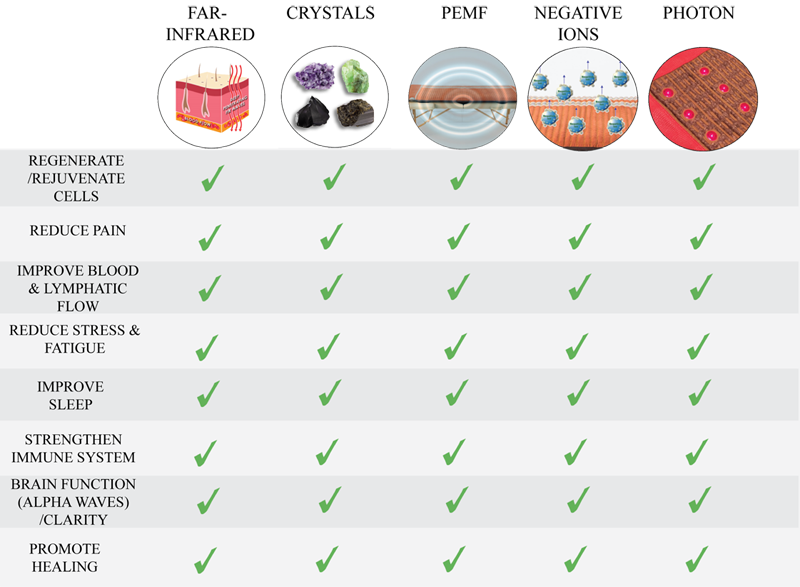 This is why the PEMF therapy is greatly enhanced when also using far infrared heat therapy as the far infrared heat improves your circulation allowing your blood to deliver more nutrients to your cells. Additionally the surplus of negative ions also provides essential building blocks for the cellular repair that is occurring. 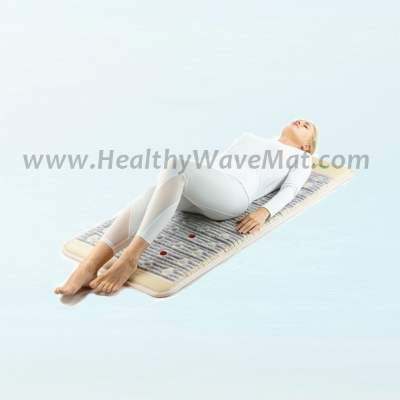 Healthy Wave Mats are the only product to combine these five therapies together making the PEMF technology found in Healthy Wave Mats more effective than any other individual PEMF device. Low Level Laser Light Therapy is used to donate photons and electrons to our cells so they can regenerate and repair themselves. This donation of protons increases the energy molecule of the cell, called ATP, which stimulates the cell to grow and repair more effectively. Low level laser light therapy is a great additional when focusing on skin and connective tissue as it provides energy to those cells to further increase their regeneration when combined with FIR, negative ions and/or PEMF therapy. 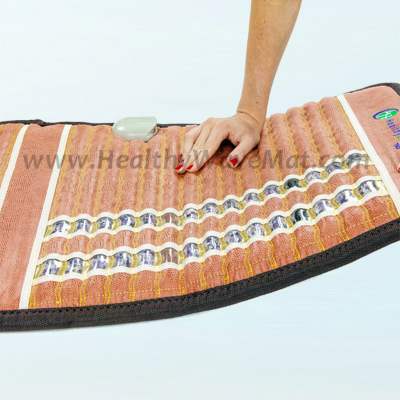 Healthy Wave Mats different therapies are all made to be the top of their individual fields and are made out of only high quality materials providing you with a full spectrum health mat that can last a life time. Materials are non-toxic & durable. 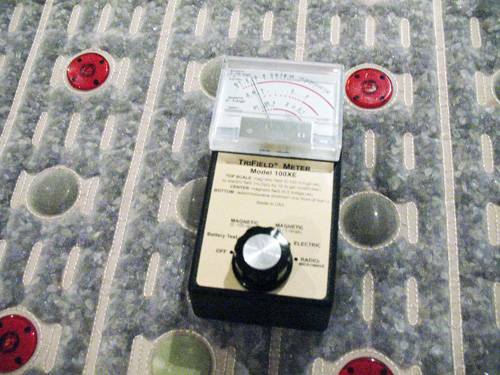 Made with EMF shielding material to block unwanted damaging high frequency EMFs. Controllers are CE & FCC certified. 1. High-quality synthetic leather, which is elegant, durable, and easy to clean. It is super-absorbent, more absorbent than charcoal. It can deodorize as well as absorb dust. It releases far infrared rays and stores heat energy. It can adjust to humidity, absorbing water in damp conditions and releasing it back into the air in dry conditions. 6. Electric discharger, which also generates negative ions. 7. Copper network layer - magnetic wave proof copper layer to shield the user from damaging electromagnetic waves. 10. Heating layer, allowing a rapid rise in heat. 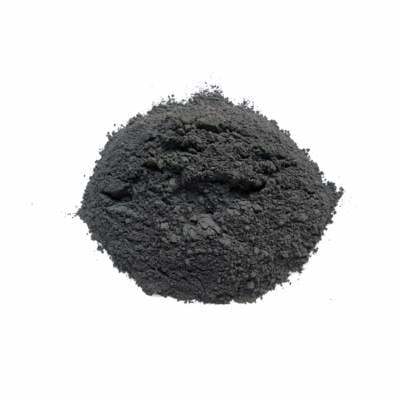 This material resists high temperatures, performs well after folding, and wears well. 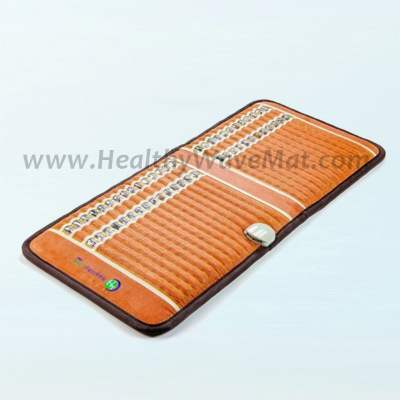 Heat-sensitive device that prevents the mat from overheating. If the temperature rises too high, it will automatically shut the power off. 11. 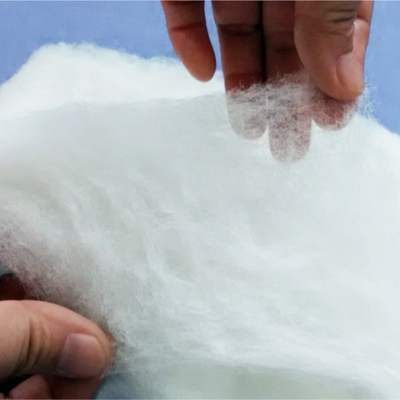 Ecological non woven cloth, to evenly distribute and stabilize the heat. 12. Heat absorption and release layer, to store the energy of the infrared rays, to evenly distribute and continually release the heat. 14. Thermal insulation layer to prevent overheating and prevent heat from being conducted downwards. 15. 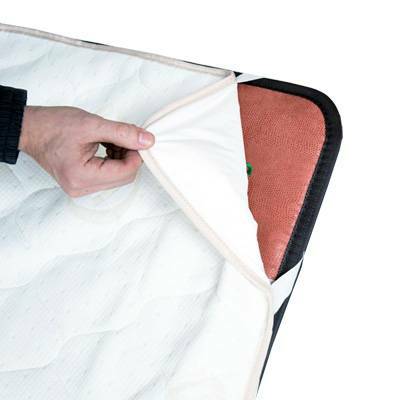 Waterproof eleusine cloth, which is durable, prevents wear, resists tension, and protects the mat. Since there are no present standards in the US, the Swedish Standard of 3 mG is used as the benchmark for the ultra low EMF design. Typical measurement for a mat at the surface is approx. 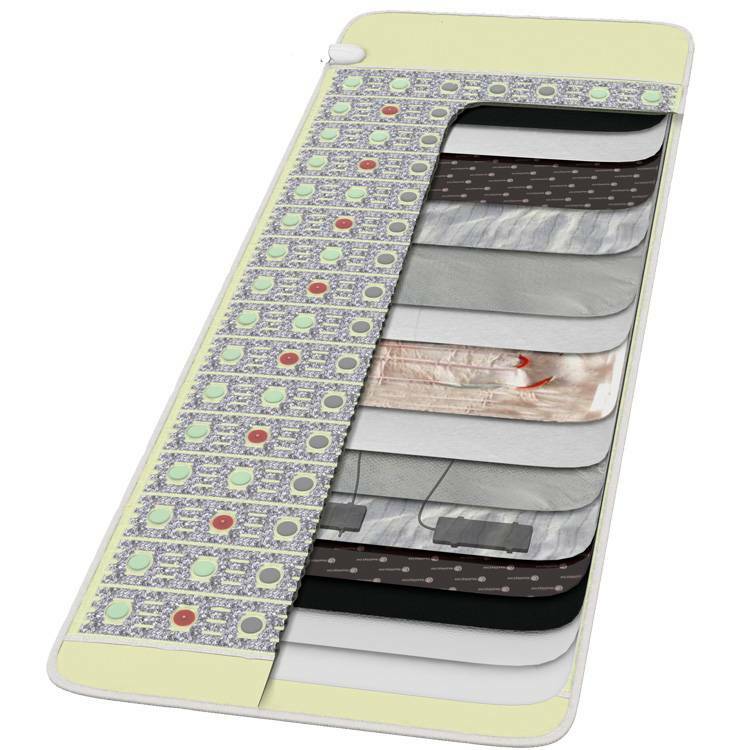 0.5 mG. For many of the different mat designs available the measurement can typically be 0.5mG to 1.5 mG which is well below the strict Swedish Standard. 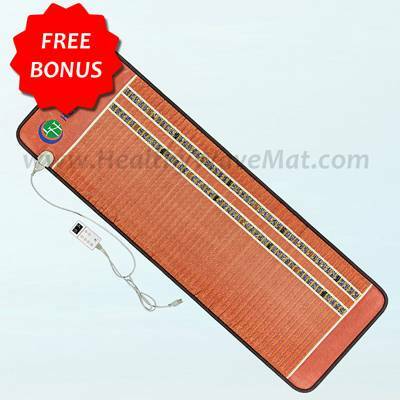 Light Jade & Tourmaline Far Infrared Heat Mesh Mat 32" x 20"
PEMF Amethyst Far Infrared Mat 60" x 24"
PEMF Amethyst Far Infrared Mat 72" x24"
Pain and Relaxation - Linda McK. 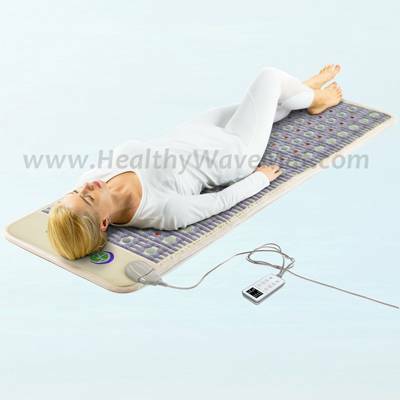 Sleep and Well Being - A.S.
Every Healthy Wave Mat comes with our 45 day risk free trial. 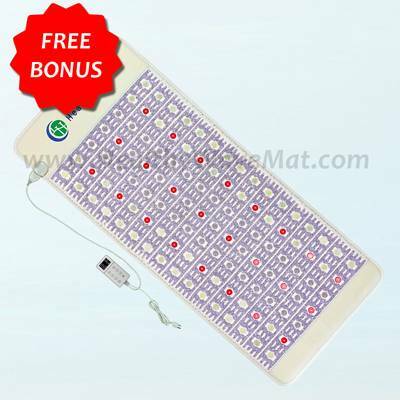 Try your mat for 45 days, if you are not fully satisfied you can return it for a full product refund!